It was recently announced that the North East Ambulance Service NHS Foundation Trust, North West Ambulance Service NHS Trust and Yorkshire Ambulance Service NHS Trust will be coming together to form an alliance across the North of England (Association of Ambulance Chief Executives (AACE), 2016). The services have said the launch of the Northern Ambulance Alliance will help to improve the efficiency of ambulance services in the areas covered by all three Trusts. It is important to stress that it is not a merger but an attempt by all three organisations to work closer together to improve patient care. Additionally, it is felt the alliance should help identify savings through collaborative procurement and offer improved resilience. So, in effect, the boards of each of the individual Trusts will still have responsibility for their individual service, but will also consider the work and objectives of the Northern Ambulance Alliance when making decisions. One of the key driving forces behind the inception of the alliance was the Lord Carter Review (2015)into productivity in NHS hospitals, which supports identification of efficiencies and reduction of unwarranted variances. Some of the areas already identified where the Trusts can work together include looking at ‘efficiency through joint procurement exercises, major changes to IT, assessing specialist expertise and learning from each other’s achievements’ (AACE, 2016). This alliance should be commended and highlights the overall commitment from each of the Trust’s to improve patient care. While demand for each service will inevitably differ due to considerations such as population and community, their strategic priorities are inextricably linked. It therefore makes sense that they should be considered together. More than anything, the alliance offers an excellent opportunity for the sharing of best practice and to tackle mutual difficulties. An example was highlighted by Rod Barnes, chief executive officer of Yorkshire Ambulance Service NHS Trust, of how the Trusts could come together to deliver on a single issue: ‘This might mean the procurement of a single agreed vehicle specification for all three services, identifying savings through the standardisation of maintenance and equipment contracts, which is something that has proved elusive at a national level’ (AACE, 2016). It has been assured that there will be no direct staff consequences as a result of the alliance. However, it may mean in the future that the three organisations consider joint appointments or shared working for new roles and replacements. It is hoped that other services will follow and create their own alliances. Who knows, it may even be one step closer to a single national ambulance service. Aryeh Myers, 39, is a paramedic for Magen David Adom, Israel’s national ambulance service. Before that he worked for London Ambulance Service NHS Trust for almost 10 years, as both an emergency medical technician (EMT) and paramedic. He was diagnosed with post-traumatic stress disorder (PTSD) just over a year ago. Myers is one of an alarming number of paramedics whose mental health has suffered directly as a result of working for the ambulance service. Recent figures published by mental health charity Mind revealed a third of ambulance staff surveyed contemplated taking their own lives due to stress and poor mental health. 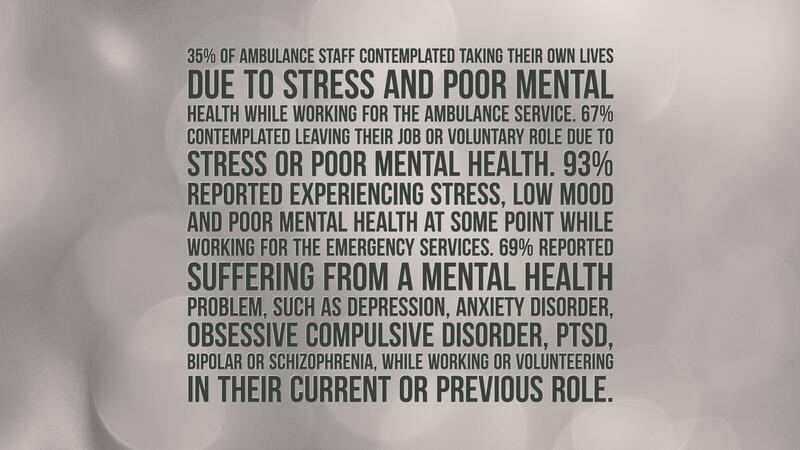 The results, taken from the responses of 1 600 emergency services staff and volunteers, including 308 in the ambulance service, also showed that 67% of ambulance staff contemplated leaving their job or voluntary role because of stress or poor mental health. A huge 93% reported experiencing stress, low mood and poor mental health at some point while working for the emergency services. The figures also highlighted how 57% of ambulance staff took time off due to stress, low mood or poor mental health. 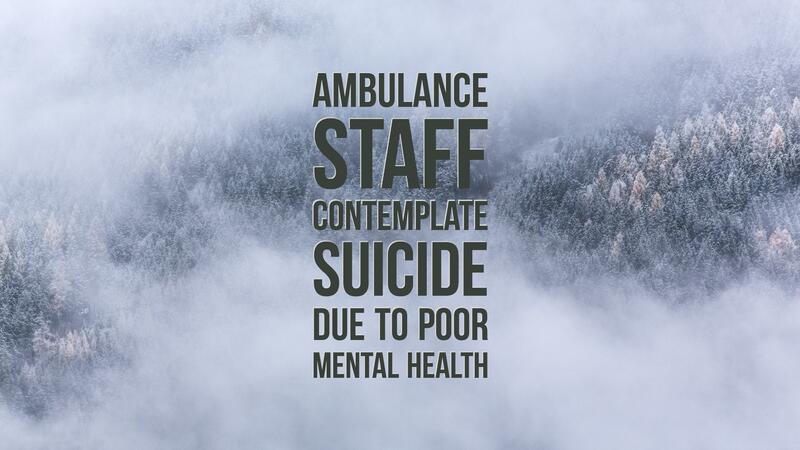 These results reaffirm those published by The Observer that revealed over 40 000 days were lost by ambulance staff in 2014 due to mental health problems. For Myers, he recalls how he took a month off work to begin treatment, including several sessions with a counsellor who taught him how to recognise triggers, how to partially ward them off, and particularly how to deal with the thoughts and reactions that those triggers bring. In October 2014, Mind was awarded LIBOR funding to deliver a programme to provide mental health support for emergency services staff and volunteers from police, fire, ambulance and search and rescue services across England up until 31 March 2016. The Blue Light Programme focused on five main areas: tackling stigma and discrimination, embedding workplace wellbeing, building resilience of staff, providing information and support, and improving support pathways. So far the programme has seen 250 000 information resources disseminated, 5 000 managers participate in line manager training, over 400 emergency services staff register to be ‘Blue Light Champions’, and 54 blue light employers and 9 national associations sign the Blue Light Time to Change pledge—a commitment to raising awareness of mental health, tackling stigma and helping enable staff and volunteers to talk more openly about their mental health at work. Currently, all ambulance services in England except East of England Ambulance Service NHS Trust have signed the pledge. Funds have been allocated for Mind to continue to deliver the programme on a smaller scale throughout 2016/17. Esmail Rifai, 50, is a clinical safety officer for North West Ambulance Service NHS Trust, who recently returned to work following a long period of work-related anxiety and depression. He lost a work colleague and friend to suicide. ‘My colleague taking his own life had a devastating effect on me at a time when I was coming to terms with my own mental health,’ he says. Dan Farnworth is an EMT for North West Ambulance Service NHS Trust who has also suffered from PTSD. While Farnworth understandably felt low after the job, it wasn’t until 24 hours later that he found himself unable to shake the image of the child from his head. In addition to his work, he found the event had begun to affect his life at home as well. ‘It made me a grumpier person, and my patience was a lot shorter. It even started to affect my sleep, and I found myself having nightmares about it. The nature of work undertaken by ambulance services means there are times when paramedics find themselves turning up at the scene of a shocking or upsetting event. Kevin Sibley is an EMT for East of England Ambulance Service NHS Trust who served 8 years within the army. A year of that time was spent in Northern Ireland where he witnessed a number of harrowing events. He remains unconvinced at the prevalence of mental health problems suffered by ambulance staff. ‘I have known people who have left the ambo service and have come back 6 months later after querying suffering mental problems,’ he says. Sibley is of the opinion that some paramedics are quick to associate distressing events with potential mental health issues, with some reaching for the latest buzz word to explain how they are feeling. Currently, ambulance services have internal debriefing support services, and through occupational health staff have access to professional counselling services. Additionally, support is provided to ambulance service staff and their families by The Ambulance Services Charity (TASC). Hayes explains how since its launch in March 2015, TASC have been approached by a number of ambulance personnel suffering from low mood, stress-related illness and undiagnosed PTSD, many of whom remain in work providing a dedicated service to the general public. As a result, the charity is currently developing a programme of support for individuals, working with a leading psychologist, which will enable ambulance personnel to recognise their own symptoms and develop strategies to help manage poor mental health. The College of Paramedics has been working closely with Mind over recent months, and is an active participant in the blue light mental health agenda nationally, along with the Association of Ambulance Chief Executives (AACE). According to David Davis, paramedic and fellow of the College of Paramedics, the College has recognised the importance of the mental health and wellbeing of paramedics and other ambulance and pre-hospital professionals for a number of years. These include significant concerns around what many feel is an unachievable retirement age of 68, significant changes in working practices and increased workloads resulting in increased isolation of practitioners, as well as concerns over violence and aggression towards emergency services workers. ‘The research undertaken by Mind, as part of the Blue Light Programme, has reinforced anecdote with real meaningful data about the level of problems, and importantly revealed that many frontline staff were not keen on being open about mental ill health and stress for fear of either embarrassment or adverse consequences from employers or otherwise,’ says Davis. ‘The most recent data was very worrying indeed,’ he adds. ‘Particularly that 35% of those ambulance staff completing the online survey had contemplated taking their own lives. Davis, who is spokesperson on mental health for the College of Paramedics, goes on to highlight that the recent College of Paramedics conference revealed a clearly expressed mandate to make mental health of the membership a priority and to support the Mind programme. The AACE is one of the national associations signed up to the Mind Blue Light Time to Change pledge and were fully engaged in the Blue Light Programme throughout its initial duration. According to Anna Parry, national programme manager for the AACE, the association is continuing to benefit from the work undertaken by Mind, with the Time to Change Programme Manager contributing to ongoing work the AACE is overseeing to promote and enhance the mental health and wellbeing of staff. At the national level, the AACE is collating information and data in this area to better understand what more can be done to support ambulance service staff. ‘The sector feels that there is more that could and should be done to fight mental health stigma and discrimination and to enhance the supports that are available to staff in this area,’ says Parry. ‘The mental health and wellbeing of staff subsequently features in the AACEs 2016–17 strategic priorities; these are identified and progressed by ambulance services nationally,’ she adds. Farnworth believes that with ever increasing demand on the ambulance service, there is not as much opportunity for discussion and reflection between jobs anymore. ‘When staff attend a particularly traumatic job, they are offered some “time out” but many staff don’t take this up when they know there are patients out there waiting for our help,’ he says. ‘The first piece of advice I would give would be “do not be ashamed”. It took me a long time to admit both to myself and to those around me that there was something wrong. 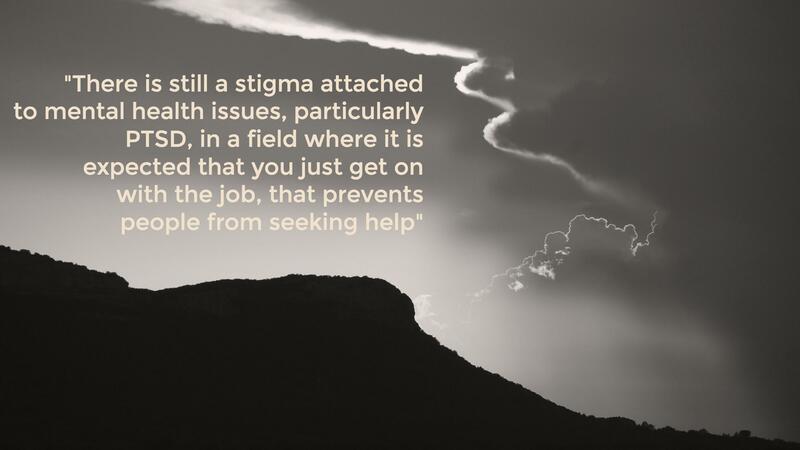 There is still a stigma attached to mental health issues, particularly PTSD, in a field where it is expected that you just get on with the job, that prevents people from seeking help. A first-line defence must be to talk, be it to a colleague, a friend or a relative, or, if the need arises, to a medical professional who will be able to give guidance with reference to the right course of treatment if required. To help raise awareness of mental health problems within the blue light community and get emergency service personnel talking, Farnworth has teamed up with Richard Morton, paramedic; Philip Baggaley, senior paramedic; and Gill Despard, paramedic lecturer practitioner, to walk from Scarborough RNLI to Blackpool RNLI stopping at fire, police and ambulance stations along the way. They will be raising money for the Blue Light Programme. The walk will take place from 26–30 September and they are inviting all emergency services, as well as the general public, to join them on the ‘last leg’ from Broughton ambulance station to Blackpool RNLI. Additionally, they are putting on a Blue Light Walk Charity Ball to celebrate the success of the walk on 1 October. If you would like to support their cause or join them then visit http://www.bluelightwalk.com.